When I first spotted the Noke Truck in February parked about a block from our house, I couldn’t believe my eyes. A food truck mere meters from where I live, totally awesome! 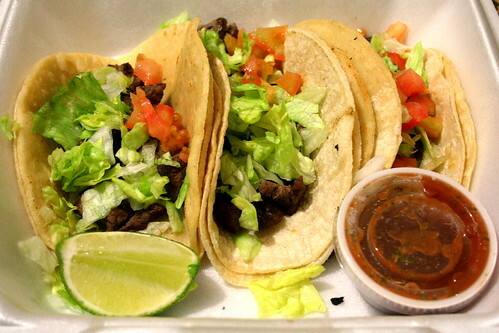 The menu ranges from an array of sweet and savory crepes to tacos to quesadillas and enchiladas made from crepes and it’s hard to pick an item to start with. A note on the service, the Urreas are swift at the stove and I’ve hardly had to wait longer than a few minutes, something that was really nice during the blustery winter mornings earlier this year. Given that we can normally find the truck parked down the street from us on Saturday mornings, G & I developed a tasty routine of throwing on some clothes, walking down the hill, and grabbing some crepes for an easy Saturday breakfast. 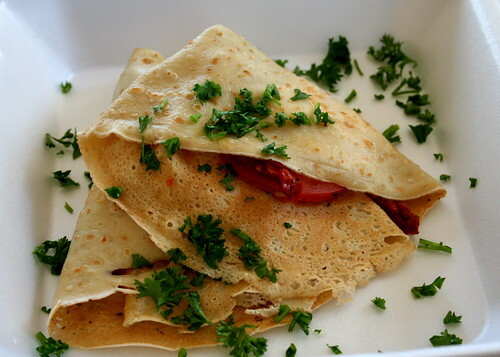 My favorite crepes to-date are these two–the Bretonne and the Caprino. The Bretonne features ham, cheese, and egg with a side salad (fantastic addition) and the Caprino is a vegetarian option of sundried tomatoes, fresh tomatoes, basil, and mozzarella. Both crepes were light and full of fresh ingredients that, of course, feel very breakfasty. In France, I obviously loved crepe combinations like the Bretonne crepe–give me some egg, ham, and cheese, and I’m set. And the side salad? It ought to be offered with every crepe. 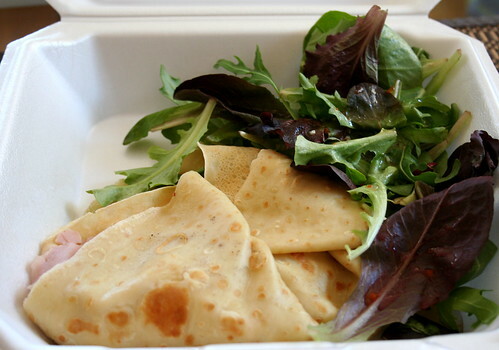 The mixed greens with a simple vinaigrette were the perfect match to the crepe. 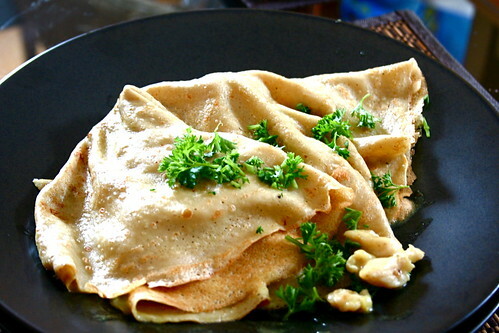 The other two savory crepes I’ve tried thus far were the Chicken Curry and the Stroganoff. More suited for lunch or dinner, the two feature chicken or beef, respectively, in a sauce, the crepes were a little too one note for me (though a side salad would have maybe added the little oomph I was looking for). Out of the two, I favored the Beef Stroganoff–the beef seemed to be of a little better quality than the chicken–but G preferred the Chicken Curry. The Chicken Curry was very lightly spiced, more salty than anything, and I found myself wishing that there was just more flavor in the crepe. Stroganoff should be simple, but curries typically burst with flavor. I wanted to love the crepe, but it just didn’t do it for me. Where the Stroganoff and Curry crepes didn’t do it for me, oh dear me, the Noke Crepe did. 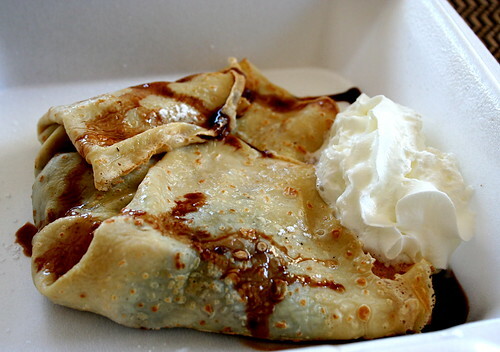 A crepe stuffed with nutella and bananas, I don’t know how it could be much better (unless there was some flaming Grand Marnier involved…). Even though I’m not the biggest sweets fan anymore (to everyone struggling with sugar addiction, I highly recommend apprenticing in a bakery for at least six months. You’ll be done with sugar for good! ), this crepe in all its simplicity bowled me over. I mean, Nutella was oozing from the seams. It doesn’t get much better than that. On the more Colombian side of the menu, I’ve thus far tried a few of the tacos and an arepa (an arepa!). 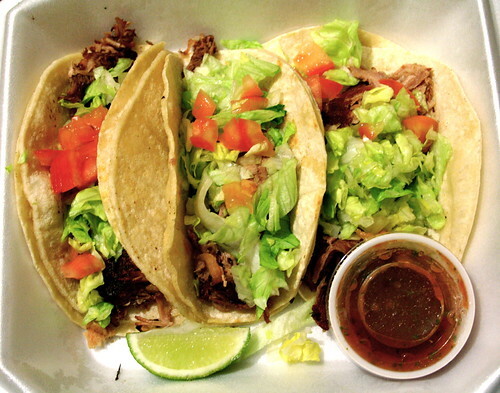 I can’t not order Carnitas when I see it, so a must for me was the truck’s version. Simply prepared with carnitas, lettuce, onion, and tomatoes (I asked for no cilantro) with a side of salsa and a lime, I found the pork to be juicy and tender, full of flavor and exactly what I look for in a taco. The salsa leaves a little to be desired, it’s rather watery and I like a bit of kick in a salsa, but that’s something that can be easily corrected. G’s Asada (beef) tacos were equally tasty–meat simply grilled with the same accouterments as the carnitas. These tacos are the kind I wish I could get after I’ve been out for an evening drinking and hanging out with friends–simple, delicious, and quick and easy to eat. Bonus item! The arepa! God, I love arepas. (I thought I’d blogged about eating some from a food truck in Chapel Hill, but I guess I didn’t…hmmm.) The truck started offering them as a limited item and I was lucky enough to nab one on the first day. 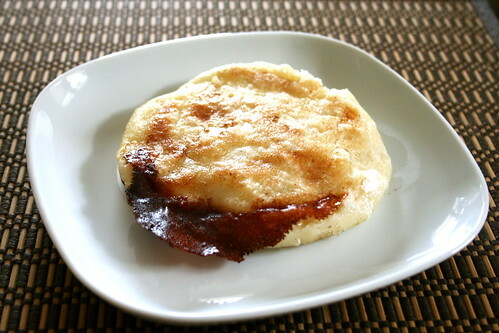 A simple cheese arepa, it was hot with crusty burnt cheese edges and a slightly sweet cornmeal exterior. I could eat twenty of them. Unfortunately, it was one that I had to split with G, but don’t tell him, I kept the bigger half for myself. 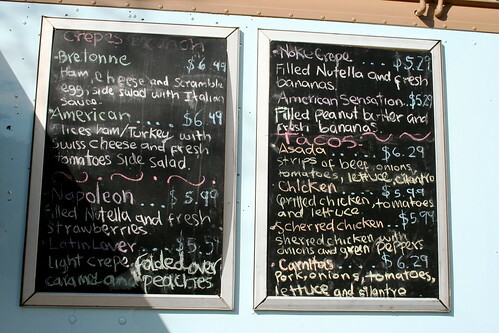 The Noke Truck is easily one of my favorite places to grab quick and tasty eats. Between the crepes and the tacos and the arepas, I’m sold (and I haven’t even tried the quesadillas or enchiladas yet). There are a few things that I like better than others, but I have yet to try something that wasn’t at least good. Plus the truck floats all over town from downtown to Grandin to even the suburbs and Williamson Road, so their reach is fairly extensive. If you live in town or you’re visiting, be sure to hit it up for some really outstanding Colombian food or for a little taste of France in Appalachia. Roanoke is about 5-7 years behind the national trends, so I’m pretty happy to see a little action here. Definitely understand where you’re coming from, but, gotta admit, the lower overhead makes it a great option for entrepreneurs! 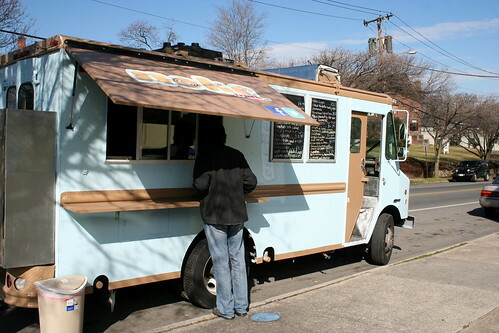 My town is too small and boring to have fun things like food trucks, so I can only dream of such things. 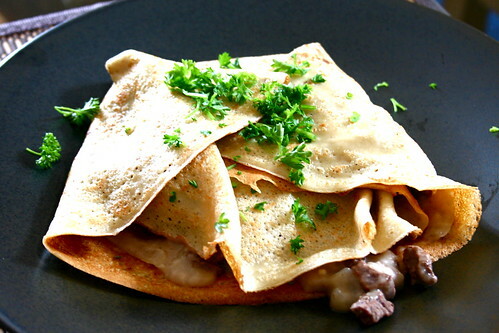 I’ve seriously been craving crepes, too…Maybe I’ll just have to make them for myself today! The idea is just too tempting. Oh yum. This reminds me of The Skinny Pancake in Burlington, Vermont, one of my favorite places to visit.